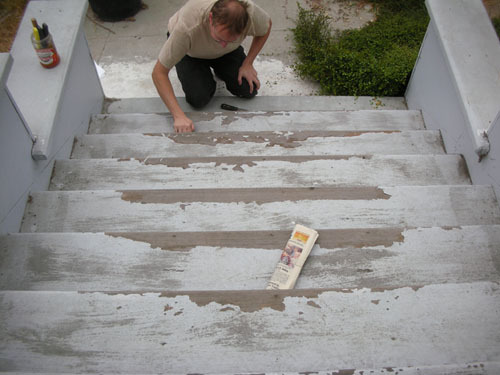 So the front steps have been peeling, and we wanted to get them repainted before the rain gets started. We have a short list of projects we need to get done the bad weather pinned to the bookcase in the kitchen, and weatherizing the front steps was #1 on that list in my mind. Yesterday I found out that the reason the paint was peeling so prematurely was on account of my having primed them before painting: apparently primer and paint combined make for a very poor walking surface. We learned that the proper first layer for horizontal surfaces is some latex paint thinned with water, so there is no differential flexibility of paint surfaces that causes peeling. Lesson learned, and we got some more paint in the right colour to redo the work. But first, we had to remove the old paint. 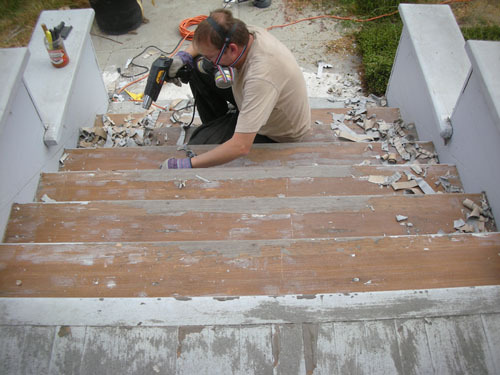 This is how the steps looked when we started: all the peeling has been happening where foot traffic goes, obviously. Noel spent some time scraping and then using the sander before he woke up and realized that the best tool for the job was really the heat gun. Once he got that out, the job went much faster. We had a limited amount of time to work today, but in less than two hours, Noel stripped all the stair tops (the risers are and continue to be fine). We need to strip the porch surface, then sand everything, and then we'll be ready to do the next step. Who would have guessed primer would be BAD? Good to know! Thats a new one to me that primer is bad, to me it sounds like a bad prep job. I have an older home as well and I always start with an oil based primer and then a oiled based paint to finish. I still don't believe in some of the latex paints/primers for an exterior area with lots of traffic. Thanks, Vincent. I guess sanding to good wood and then priming is insufficient as a prep job for stairs? What else should I have done? You could use a solid stain as well, stain doesn't peel, it just wears over time. You have to get all the paint off, but it looks like you did. Yes, Derek, we have all the paint off now. Heat gun plus sanding: not too terribly complicated when you're dealing with modern paint as opposed to the battleship paint we have in some places. I'm not a fan of solid stains: they don't come true to colour matches, and the available colours are never quite what I want. why do you insist on spelling colors the other way? Which colours am I spelling the wrong way? In your comment you had said latex paint thinned with water, I wouldn't ever put a latex product on a high traffic area such as stairs. I do know good oils are hard to come by but Kelly Moore sells an exterior under coater and very good high traffic oil/alkyd stair paint. I used the under coater on the front of my house which gets full sun all day and it hasn't popped or peeled to this day as well as my stairs. I have also used Marks Paint for Benjamin Moore paints and like their paints as well, depending on what I am painting they both have good products. Vincent, you said that you thought the latex peeled because of poor prep. Given that, I assumed that when you said poor prep you meant something that happened before the paint went down. I don't share your superstition about latex paint and porches. For one thing, several of my neighbors have steps painted with latex and those show no sign of trouble. And I usually buy Benjamin Moore paint. They now stock it at Pagano's. 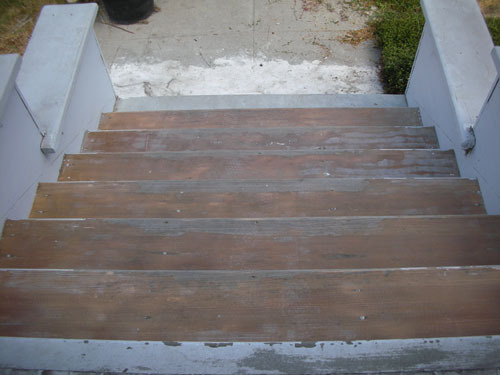 I don't know whats under the wood steps but have you thought about moisture drive from underneath pusing the paint off? Can you get under the stairs and paint the undersides? That's a good point, Daniel. I'll wiggle under there and do the bottoms, too.